We were shown into the quiet room by Dr Cook, where we were joined by Evan Marshall and a cardiac liaison nurse who was introduced to us as June Winter. 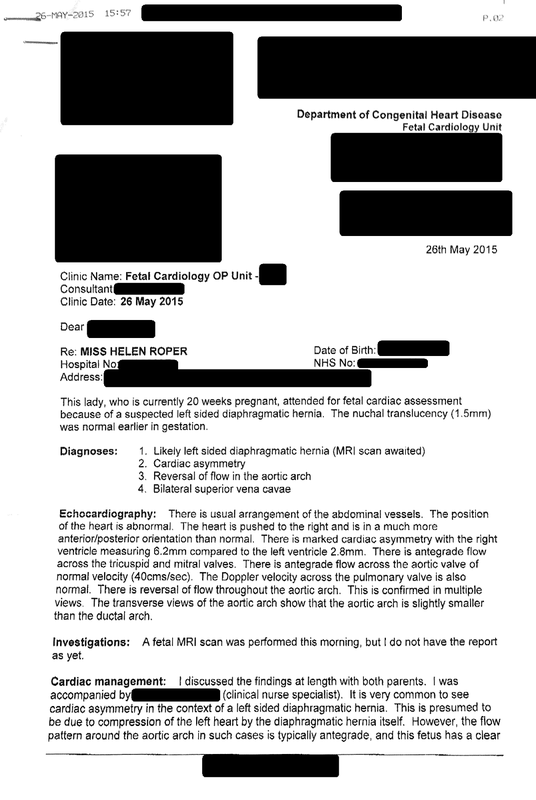 Professor Marshall explained the scan findings: our baby had her heart shifted to the right side and rotated. Her left ventricle was around half the size of her right, whereas they should be roughly equal. She also had a narrowed aortic arch through which the blood flow was reversed, and she had two superior vena cavae ('bilateral SVCs'). All embryos start with two, but by this gestation you would expect one to have disappeared. He drew a lot of sketches. Prof. Marshall explained that a 'mediastinal' (towards the middle) shift of the heart is common with a diaphragmatic hernia, and he thought he could see a shadow of the hernia. He said the ventricular asymmetry could also be caused by this, with the abdominal contents allowed through by the hernia compressing the left side of the heart. He said it was possible that repairing the diaphragmatic hernia at birth would reduce the compression, the left side would recover and function normally, and there would be no further cardiac problems. However he stated that typically you would not see retrograde (reversed) blood flow through the aortic arch in a baby with an underlying normal heart. It was possible but unlikely. 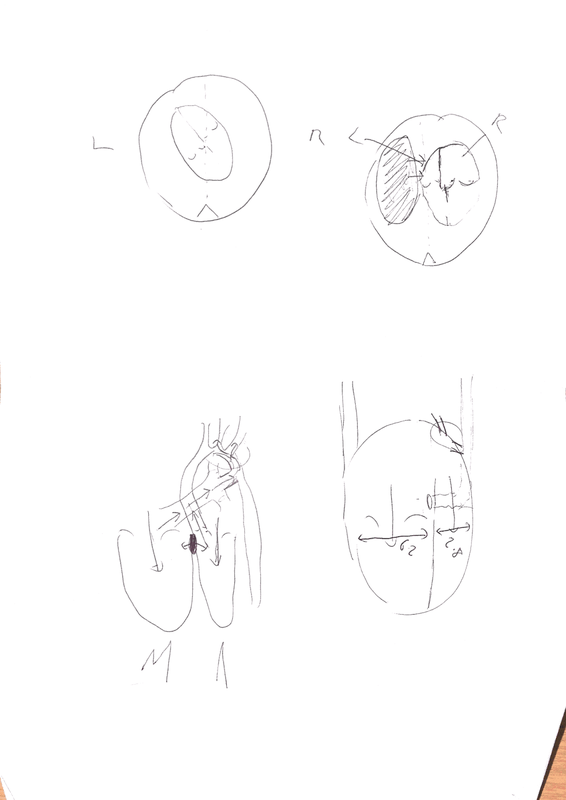 He stated that the retrograde flow raised the possibility of Coarctation of the Aorta (PDF). 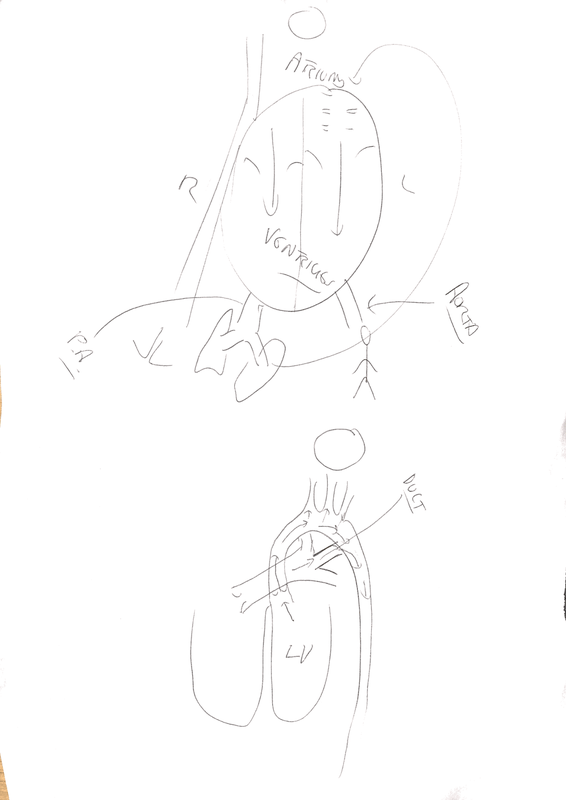 In this scenario, the diaphragmatic hernia repair would mean that the left ventricle compression would be relieved and the heart would function, but the coarctation would also need repair. 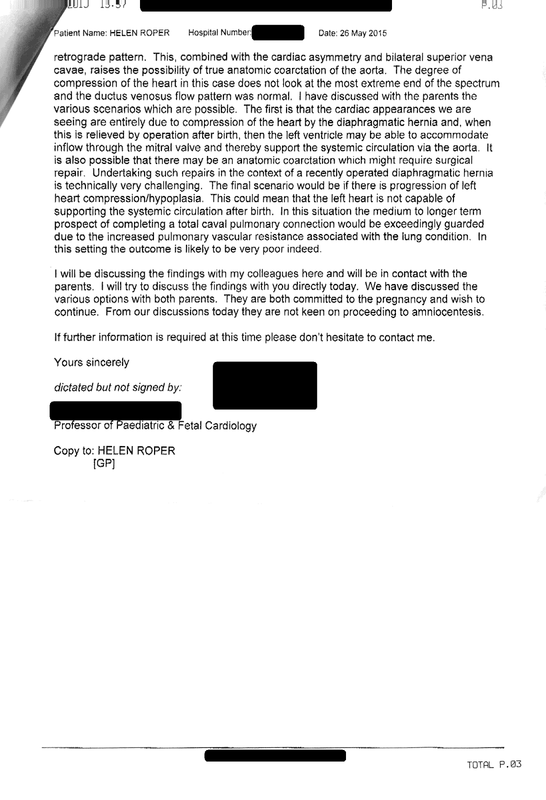 He felt that repairing a coarctation in the context of the typically small lungs and high pulmonary vascular resistance caused by the hernia would be highly challenging, with no guarantee of a good outcome. The worst situation would be that the ventricular asymmetry was not caused by the compression from a diaphragmatic hernia, but was a genuine anatomical difference. This could indicate a single ventricle defect, most likely Hypoplastic Left Heart (PDF). He did not see the other typical heart differences you would expect with this diagnosis, but was unable to rule it out. He felt that repairing a single ventricle defect in the context of a diaphragmatic hernia would be very difficult, if not impossible, and he said he did not feel it would have a good outcome. However, he also said that if we googled, we may find cases of success in this situation, and he too would be looking for and consulting with his colleagues about similar cases. He also discussed palliative surgical options. He was positive about trying everything he could, but he wasn't optimistic about a good outcome in any circumstance but the first, which he seemed to think was the least likely. In addition to this, he told us that while the bilateral superior vena cavae were not in themselves a problem, they were often associated with genetic syndromes and asked us if we had considered amniocentesis, which we weren't keen on. He then left and the nurse June Winter gave us some time and then showed us out the back entrance. We were upset: the bad news was piling up on us. We had promised to go back to get the MRI results, so headed back to the MRI department, hoping there wouldn't be more bad news. We waited a while before being shown across half the hospital to the specialist department for viewing the brain images. There were no significant problems, which was a relief, but they had noted a very small vermis - below the 1st centile. The vermis is part of the cerebellum; apparently it helps in controlling movement and vision. They couldn't tell us what having a small vermis would indicate at this gestation, since nobody has done enough fetal brain MRIs to know, but they could say that, again, it may be linked to a syndrome. George Donnachie came into the room at this point. He was very sympathetic. He'd already spoken to Prof. Marshall and he offered us an amniocentesis, but was understanding when we said we wanted to think about it. We went home with little hope - a baby with brain, heart and lung anomalies: there didn't seem likely to be a good outcome.